Daniel earned his Master’s Degree in Physical Therapy (2007) from the University of Missouri-Columbia where he also received a Master’s Degree in Biology with an emphasis in Genetics (2004). He has a passion for furthering his skills and in 2013 became certified in a branch of manual therapy (CMP) that is known worldwide for an effective and pain-free restoration of motion. After some time living and working in Oregon and Arizona, Daniel and his family moved back to Northwest Arkansas where he was born. As a physical therapist, he has worked in a variety of settings including home health, inpatient, work rehabilitation and outpatient facilities. Daniel always wanted to work with children, but it was only after having his own three kids that he became confident enough to pursue a career in pediatrics. Daniel believes in the body’s ability to heal and develop throughout a healthy movement. He is passionate about finding that one thing that makes all the difference in someone’s ability to experience life with less pain and/or limitation. In his personal life, he’s passionate about his children and being the kind of father that lets them grow into the happiest version of themselves. Daniel enjoys volunteering at running events; it’s fun for him to be with people who are pushing themselves and having fun. Daniel’s favorite non-profit organizations are the Heifer Project and World Wide Fund for Nature because they’ve been around a long time and do good things. Daniel is a Certified Mulligan Concept Practitioner (CMP). CMP is an effective manual approach that addresses musculoskeletal disorders with pain-free manual joint “repositioning” techniques for restoration of function and abolition of pain. Daniel recently completed the certification process to become a Pediatric Certified Specialist (PCS). Altogether, Daniel put in around 400 hours over a 14-month period to pass the certification exam. Daniel feels that passing the exam is really the icing on the cake. He feels that his ability to help children has really advanced over the past year. He has also been trained in the Learn to Play the NDT way. Daniel may be contacted at danielhodgson@mykidsunlimited.com. Shawna holds a Bachelor of Science in Exercise & Sports Studies and a Doctorate of Physical Therapy. She graduated from Tarleton State University in 2005 and Texas Tech University Health Sciences Center in 2009. She is married with one child. After living in Utah for 5 and a half years, Shawna moved to the Farmington area to be closer to family and we couldn’t be happier! She is a certified infant massage instructor and has over 8 years experience working in pediatrics. Her experience includes pediatric outpatient and early intervention which specializes in the birth to age 3 population. 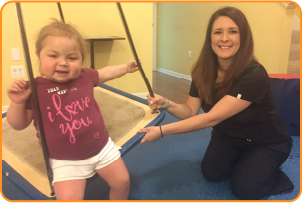 Shawna is passionate about enriching the lives of children through her work by helping them learn to move and improve their function and mobility. In her free time, she loves to participate in community activities and is an avid reader. She also enjoys outdoor activities. Shawna may be contacted at shawnawalter@mykidsunlimited.com.